I feel the force to be strong again from Japan! This time (or Now),The Japan Hot Toys has become a domestic dealer representative the "Star Wars" product that an American major toymaker "Hasbro"
With the history of 35 years making, We reboot this legendary line which inherited modern figure culture as a more attractive series in Japan. Not to mention the handling of every product, We will bring it in consideration of Japan's original development like our style through various markets. The Masterpiece "Star Wars" whom George Lucas created. We take responsibility and passion for an item made in Hasbro and want to continue making the history of the Star Wars figures with for a new chapter of Episode 7. Please expect more in new partnership of Hasbro Group, Lucasfilm and Hot Toys. September 24, 2014 Hot Toys: Movie Masterpiece Series Chewbacca! September 24, 2014 Hot Toys: Movie Masterpiece Series A New Hope Han Solo! 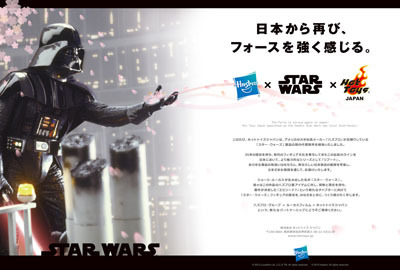 September 18, 2014 Square Enix: Play Arts Kai Star Wars Darth Vader (Kinda) Revealed? May 2, 2012 What's Next For Hot Toys' 1/6 Scale Collection?